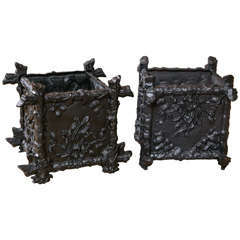 Large English Cast Iron Wall Planter Dated "1914"
These are a very attractive and original pair of cast iron, wall hanging, English Planters from the Regency period of the early 19th century, circa 1820. Each planter is semi-circular in profile with vertical fluting in the centre section. There is a trailing vine pattern, cast into the iron, as borders at the top and the base. 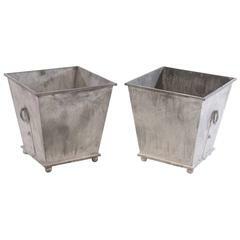 These planters would look superb on a wall in a conservatory or garden setting and are fully usable, as well as very decorative. The planters have been professionally restored and re-painted black. Rare and Very usable Restored. Large Chinese Porcelain Jardiniere or Planter Jar Blue and White, Qing 19th C.
A pair of lovely French black painted cast iron planter boxes with a twig and foliage design. 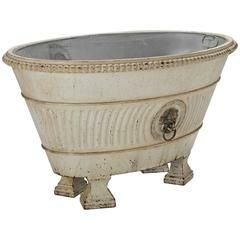 Two Pair of Classic Regency style cast iron garden planters available with rings in wonderful weather resistant lead grey color. Priced per pair. Pair of late 19th century planters with great stance and color from France. Perfect in the garden or inside the home. 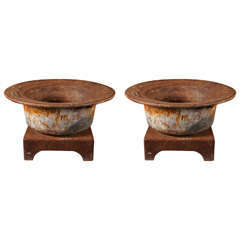 A pair of fine interior or exterior use Regency design teak and age painted brass bound and bronze-mounted oval planters with zinc liners.